I was randomly searching around on YouTube one night recently and came across a few videos of old games I used to play growing-up. It dawned on me that two games in particular featured maybe the most unlikely playable characters in an action-adventure style game: worms. Earthworm Jim and Worms: Armageddon are a couple of games that were not only well-crafted, but also just a lot of silly fun! 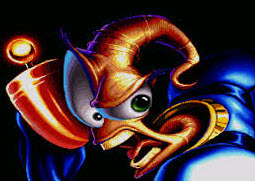 Earthworm Jim occupied me for hours when it first bowed on the SNES. Created by Doug TenNapel (whose art style and outlandish stories I always seem drawn to), he really helped realize a bizarre and unique video game world. The animation on display for a 16-Bit game is still charming and freakishly funny. The interplay between Jim and his somewhat-sentient space suit creatively play off of each other and provide a lot of funny moments. Whether launching cows, zooming through an asteroid-dotted worm hole, or dodging shots fired by Evil the Cat in a hellish landscape you quickly learn to turn off your brain and soak-up the fun. At a time when gamers had begun expecting more realistic graphics and arcade-style beat ’em-ups, EWJ had you traversing a silly galaxy in your quest to save Princess What’s-Her-Name. A cult classic garnering sequels, toys, comics, a cartoon and even an HD remake – if you haven’t played this you’re missing out! Next up is Worms: Armageddon, which holds a special place in my heart as the sweetest, most-violent game I think I’ve ever played. Where EWJ was silly and frenetic, W:A employed a more methodical, tactical pace but had just as outlandish scenarios coupled with addictive gameplay. In fact, W:A is probably the only game I’ve ever been able to get my wife to play (at length!) and not only want to play more, but still smile and laugh about how much fun this game is years later. Here you command a motley crew of adorably-deadly battle-hardened lil worms against an opponent’s team on a ridiculous series of platforms. The tiny voices, the hilarious air strikes, weird settings and full-level view of the battlefield keep you coming back for more. It’s hard to not laugh throughout, whether you win a match or not (including those moments when you accidentally manage to off yourself). The moment the game ends you’ll be ready to pick a new stage and pit your team against friends time and time again. Again, looking back at two very different games that really stand the test of time in terms of overall appeal I’m just surprised worms could be so fun to play with. Probably time to dig out an old console or two!